Update on Mundus Varaždin's workers struggle. First article can be found here. 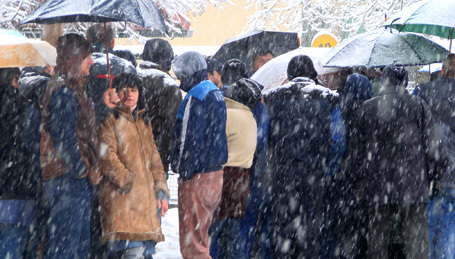 On 1 December, the workers of Mundus Varaždin began their two-day strike. The reasons behind the strike range from late salaries (which also happen to be lower than the national minimum) and an unsafe working environment to issues related to unpaid transportation expenses and the workers' pension fund. The workers have also pointed out that the managment has not been providing them with regular financial reports. The Network of Anarcho-Syndicalists (MASA) reacted with two letters – one to the workers , in which they expressed their solidarity , and one to the managment, in which they emphasized the demands made by the strikers and insisted that they be met immediately. On 3 December, the company's electricity was shut off due to unpaid bills. On the same day, the striking workers received their salary for October, as well as a smaller amount meant for their transportation expenses. The strike came to an end, but the struggle was far from over. Five days later, on 8 December, it was announced that several workers would be fired due to their participation in an „illegal work stoppage“. The employer claims that the workers have done harm to the company because they began the strike without an official announcement by their union. They were also accused of insulting the employer and obstructing traffic on a nearby road. The Regional Industrial Union (RIS) has voiced their support for the accused workers and has announced that they would not let the employer's decision go by without a reaction from the union. Croatia: Struggle in "Mundus Varazdin"